Disclaimer: Nesi Altaras is a columnist at the Daily and Noah Habeeb is a former executive copy editor at the Daily. Neither was involved in the writing of this article. The Tufts Community Union (TCU) Senate passed a resolution calling for divestment from four companies it says are involved in the Israeli occupation of the Palestinian Territories during its meeting on Sunday. The meeting saw a large crowd and more than three hours of debate, as opponents criticized the timing and language of the resolution while proponents stressed the importance of joining a social movement and drew parallels to divestment from South African apartheid. In the end, the resolution passed with 17 in favor, six opposed and eight abstentions. When the meeting entered the discussion phase, supporters read a statement introducing and giving background to the resolution. The statement drew parallels between the resolution and a 1979 vote that encouraged Tufts to divest from apartheid South Africa, and called for Tufts to divest from Elbit Systems, G4S, Northrup Grumman and Hewlett Packard Enterprise for their ties to Israeli military and prison technology. The resolution also called for Tufts to place a screen on its investments that would account for human rights compliance. 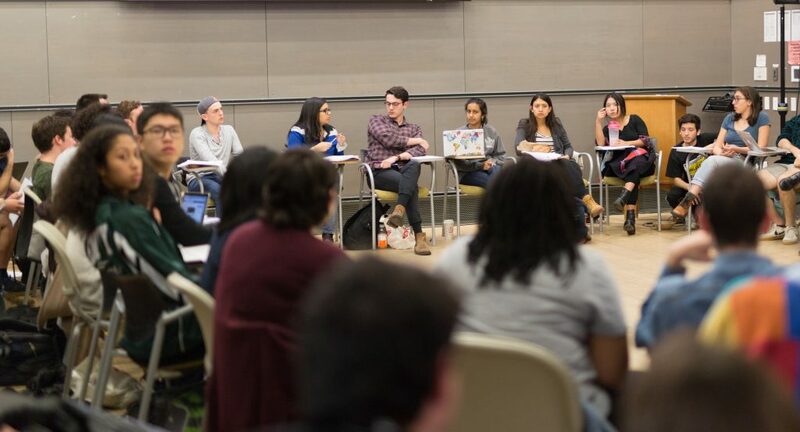 According to the resolution, although Tufts’ specific investments are unclear, the investment policies do not currently account for the investments’ social impact. In a statement from the Office of the University President, Tufts stated that it does not support boycotts of Israeli institutions. “While members of our community vigorously debate international politics, Tufts University does not adopt institutional positions with respect to specific geo-political issues,” the statement read. In addition, the statement noted that Tufts’ ability to divest is limited because it does not invest in specific firms. In the Senate debate, the resolution’s backers emphasized that the goal of the resolution is to make a statement that Tufts should not profit from human rights abuses. In a later interview, Noah Habeeb, one of the authors of the resolution, explained that passing the resolution was just a first step. The Senate meeting on Sunday was the last of the semester, but also took place the day before the Jewish holiday of Passover, leading some to worry that opponents of the resolution could not attend. Sophomore Class Senator Nesi Altaras, who strongly opposed the resolution, expressed concern that the timing of the resolution was deliberate. One of the resolution’s co-authors, senior Hannah Freedman, insisted that the timing was not intended to be close to Passover. In an interview she pointed out that comments submitted online from those who could not attend were read aloud during the meeting. Freshman Class Senator Pedro Lazo-Rivera said that, even if the resolution was not intentionally set to be the day before Passover, the number of students on both sides who asked for the resolution to be tabled so they could be heard proved that the resolution was ill-timed. Habeeb criticized the allegations that the resolution was intentionally timed during Passover. In addition, Tufts Friends of Israel Co-President Jenna Friedman worried that the resolution had not been given enough public attention. In particular, she expressed concern that the issues behind the resolution were too complex to be discussed in the short time between the resolution draft’s release and the Senate vote. The language of the resolution itself also came under scrutiny. Sophomore Eva Kahan said that much of the resolution was ambiguous, leaving it up to interpretation and implying ties to the Boycott, Divestment, Sanctions (BDS) movement. Altaras also criticized the wording of the resolution. “The language of that resolution, that was deliberately vague enough to allow for an interpretation that meant there should not be a state of Israel, is anti-Semitism,” Altaras said. Freedman rejected claims that the resolution could imply a question of Israel’s right to exist. “This resolution was not deciding the question of Israel’s existence, it was proposing divestment from corporations that profit off of the Israeli occupation of Palestine,” she said. Student safety was also a central concern of the discussion. To protect students from possible harrassment, the Senate livestream of the resolution meeting was audio-only, and senators and audience members were not referred to by name. Photography and video recording were also prohibited inside the Sophia Gordon Hall Multipurpose room during discussion of the resolution. “There have been numerous recent incidents regarding groups like the Canary Mission, who publish public information about people who support BDS and other anti-Israel measures, and we wanted to ensure that we maintained the safety of everyone in the room,” Parliamentarian Adam Rapfogel told the Daily in an electronic message. At one point during the meeting, a student was seen videotaping the meeting. The Tufts University Police Department (TUPD) was called and the student was asked to delete the video and leave the room. Another student was accosted for having his phone out, and people in the room were asked to refrain from using their phones during the rest of the meeting. Freedman agreed, saying that people who organize for Palestinian causes are often targeted by political repression. “Students and faculty on this campus that have been involved in Students for Justice in Palestine have profiles on a McCarthy-era scare tactic website,” Freedman said. Habeeb expressed hope that the resolution could pave the way for other divestment campaigns at Tufts.